Jack Hinton (left) as my Dads best man. 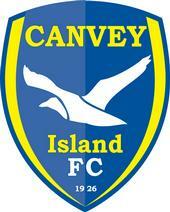 I’ve always had a bit of a soft spot for Canvey Island Football Club, the reason being a man by the name of Jack Hinton. Jack was my great uncle. He moved to Canvey from East London and in the late 1950s he joined Canvey Island Football Club as reserve team manager. He had been a useful footballer before the war, and even when hostilities broke out he still played whenever he could. Unfortunately he suffered a severe injury in a motorcycle accident which ended his footballing career, so he turned to management and administration work within the Ilford & District league and also managed one of Leytonstone’s teams. Now uncle Jack was a character. As children we used to go to his house in Urmond Road, Canvey and would spend long Saturday afternoons playing football or cricket in his garden while he and my father were at Park Lane. When they returned from football, Jack, a member of the magic circle, would put on a magic show for my me and my cousins. I remember one trick he performed on my Auntie Tessa. He put her arm into a contraption with a huge knife bolted to it, the knife would be draw down and would appear to slice through her arm. We would all gasp! But of course auntie Tessa still had her arm. To this day I don’t know how he did the trick and I’m not sure I want to know either! It was during one of these magic shows that we found out the full extent of Jack’s war injury. The motorcycle accident had damaged his right leg, which led to it having to be amputated. Of course uncle Jack didn’t want us kids to know that his war wound was received working as a dispatch rider so he told us that he’d been run over by a German tank! I remember we all stood open mouthed as he told us – what a hero! Jack progressed through Canvey Island FC and became club chairman. Along with several others he worked tirelessly for the club putting on the social activities and mucking in with maintenance on the ground. Reg Wellman, a good friend of Jack’s and a Park Lane regular, recalled a time when they were working together on the pitch. It was a cold wet day and the ground had become very boggy. Jack was working by the corner flag when his boots became stuck in the muddy pitch. As he pulled his leg up, the artificial limb came away and was stuck upright in the mud. Imagine the scene as Jack, hopping on his good leg, tried to pull the other out of the thick mud! Jack also played a part in discovering one of the South East Essex area’s finest footballers, Peter Taylor. Taylor played for Canvey before being sold to Southend United for £100. When he left the Shrimpers for Crystal Palace the London club paid more than £100,000 for his services! He then went on to play for Tottenham and Orient before turning to management with Southend, Gillingham, Brighton, Leicester, Hull City, Crystal Palace, Wycombe Wanderers and recently Bradford City. He also famously took charge of the England national team for a fixture with Italy – his legacy, appointing David Beckham as England captain. A packed house at Park Lane for the visit of Southend United in an FA Cup replay.